I had my endo appointment this morning at UCSD with Dr. Edelman, and I was so excited to see that my A1C was in the 6% range again, with virtually no lows. Until I started wearing Dexcom, I had never been able to get my A1C below 7% while pumping, without starting to experience frequent and severe low blood sugars. It wouldn’t happen, and couldn’t in order for me to be safe. I’ve been wearing the device pretty much non-stop since I started working at Dexcom over a year ago and have had one year straight of consecutive A1C’s in the 6% range, I’ll take it! At first I thought it was beginners luck (kind of like when I started pumping, everything was perfect, then it went kersplat), but it has continued. The information that it provides me on a daily basis has been invaluable (enlightening?) to me, and I feel absolutely lost and uncomfortable without it. Those trend arrows are priceless and I need them to get through my day. Anymore, I almost can’t remember what it was like to not have type 1 diabetes (like I lived for 25 years of my life). Now, I barely remember my type 1 diabetes life without Dexcom. 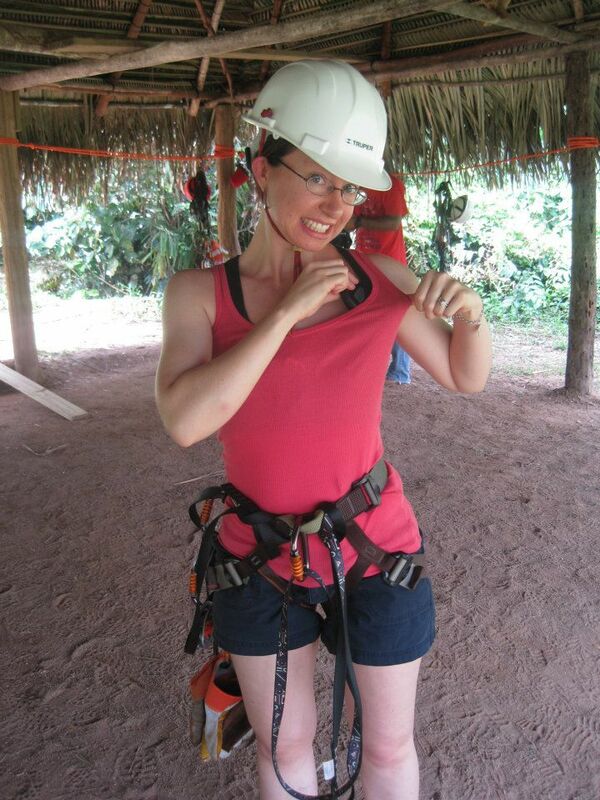 Even when ziplining in Belize-my Dexcom was the one thing I couldn’t leave behind. This entry was posted in Diabetes by livinglikelinds. Bookmark the permalink. WOW, 6%, THAT’S AWESOME!!!!!! I know how extremely hard you have worked to get that 6% so you deserve it. Proud of you!!!!!!!!!!! Way to go Linds- that’s awesome!! I’ve had pretty much the same “luck” since starting the Dexcom. Even when I’m going through a rut where I’m bopping up and down, it still isn’t as high as when I’m not using the CGM, because I fix the high or low earlier. I tell EVERYONE to get one!!!! Thanks Cat! Isn’t it amazing how life changing it is?! I was so hesitant to reduce my high threshhold for fear of it alarming constantly, but instead, I just catch the spike sooner, and can react quicker, thus preventing more highs, and I’m sure just dropping it 20 points makes a huge impact on an A1C. I’m glad you’ve had the same luck with your Dexcom!